Now if you have known me for a while, you’ll remember that before I met Ajay, I was the kind of person who didn’t care about airline loyalty, firmly believed that “cash is king” and paying to get a credit card for me was a complete NO. I was exposed to the subject of miles and points (not by choice!) by Ajay in 2014 and since then my perspective has changed phenomenally. I won’t lie, it is still quite a task to discipline myself and pull out that plastic card instead of a crisp note from my wallet every time I buy something, but I am beginning to realize the benefits of plastic money. It has made my travel comfortable in unexpected ways and therefore from being a NO credit card girl today I carry multiple credit cards in my wallet. When Ajay first wrote about the 50% bonus on converting Citi points to BA Avios, I sort of overlooked the post. Reason, we have 3 Prestige cards in the family and our spending buckets for each card is segmented. So that leaves me with using my card mainly for home expenses, recharge my PayTM account, pay for a few dinners and do all my international spends when travelling abroad. This also means that I don’t stack too many points on my card and I when I first read the post I thought why even bother considering the transfer opportunity. However, today Ajay asked me re-consider transferring some of my Citibank Prestige points to Avios. I didn’t want to invite an argument and say No to him straight away. So I decided to check on the number of Prestige points I have accumulated and then I could smartly tell him that there is no point converting a miniscule number. I checked and I have collected just over 9,000 Citi points so far over the last few months. What that means is if I transfer these points into my British Airways account until October 31, 2017, the 9,000 points will equal to 54,000 Avios. I then thought what good will 54,000 Avios do for me. Ajay and I redeemed miles and flew BA First Class just this August on their 787 from London to Mumbai and I remember he told me that the one way ticket costed each of us close to 100,000 Avios. So what will 54,000 Avios get me? Turns out I can redeem an economy class return ticket for myself from Mumbai to London Heathrow for 50,000 Avios. Even lower if I choose off-peak day prices. Not that I don’t know that I will have to pay about INR 10,000 towards taxes and fee. If I spend cash or use my debit cards to pay for these essential expenses, I don’t get anything in return. But by just redirecting the spend on my credit card, today I am fueling my passion to travel. To the power women reading this, how many of you spend more money on your cards than use cash? Hi Shivani, with the assortment of Oneworld alliance airlines such as, Cathay, Qatar, BA and AA, Avios is a great currency to have. 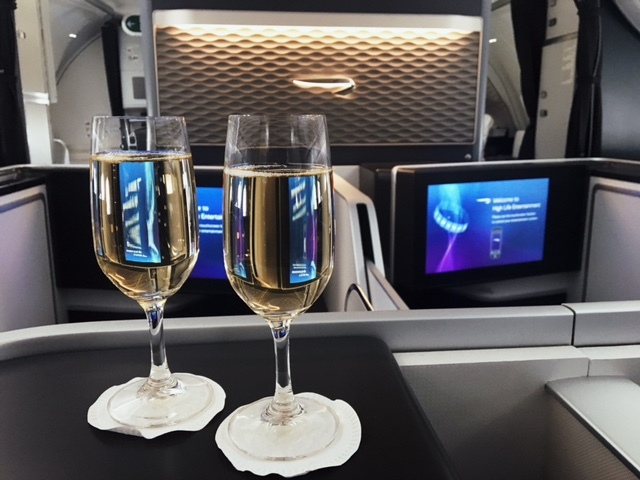 We used our Avios last year to fly London-Mumbai on BA First Class. The 1,80,000 Avios for both of us, saved us almost 7 lakhs rupees trip back home. I carry multiple credit cards in my wallet. Why bother with the wallet? Why not try Samsung Pay, assuming you have a Samsung phone. Lots of great offers from time to time. And less botheration of carrying too many cards. @Majumdar, Samsung Pay is only available for the higher end Samsung Phones. And we are an apple family! Encouraging post and not that I disagree on the premise of using CC for raking points but the example at the end is hardly convincing when economy BOM-LHR one ways are going ~INR 12K-17K-19K (TK, EK, EY etc). So much for the “free ticket” when you end up paying 10k (as you yourself pointed surcharges & fees. @Rishabh – Yes so much for the free ticket for no extra spending effort 🙂 Especially, if I can also pool points and cover up for that First Class seat that is going one way for 3 lakh plus. @Rishabh, the one-way you quote is a far out date example. I’ve redeemed economy tickets worth 450$ using 7500 Avios on a last minute itinerary. We can choose to slice and dice it the way we want. But at the end of the day, points still matter and are not irrelevant. Besides, these are an add-on to your spends, not specifically spends made to generate free tickets. @ajay, Shipra – I did not mean to contest the idea of CC Points for miles in any way and maybe I dint make it clear enough in my post (which AFAIK I did). Sure they’re awesome and I use it all the time and your blog is really helpful from an Indian perspective. What I just mentioned that the one way economy BOM-LHR example was not the best one (and neither would probably be a good redemption if doing a dollar per mile comparison) considering running rates and their surcharges on award tickets. Also, sure if you’re looking to leave tonight then 10 days from now seem ‘far out’. These were fares Can be seen all throughout nov, dec and beyond. Anyways – have a nice day! @Rishabh, this quarter is slow for all airlines out of India. You’ll see tonnes of deals. Why do you think 9W is doing a 1/2 off on miles. No one is flying. For people who want to travel in Asia in coming months, Avios is a great currency for that too thanks to Cathay Pacific. Redemptions are great, 54K Avios would mean a business class return to HK or Economy return to Japan, if I recall correctly. And Avios don’t expire if there is account activity, so a really great currency. You also get tier points on partner flights, a rarity. How does 9k Citi points transfer to 50k avois? 1 Citi Prestige point = 4 Avios on a usual day and 6 Avios during the special promotion between Citi and BA. @Ajay How long did the transfer take? Is it instant? @ Amex Guy The airmiles will get credited in the regular ratio of 1:4 within 2 days of requesting the transfer. The bonus will kick in 2 weeks after the promotion is closed. @Shipra — Interesting. For me, the whole 1.5X points came as a single blob on 3rd working day. Like, they did not split 1.0X and 50% bonus, they came as one single transaction, although Prestige line said the bonus points will take time. Do you recommend doing the same with premiermiles as well? @JG great offer for PremierMiles as well.